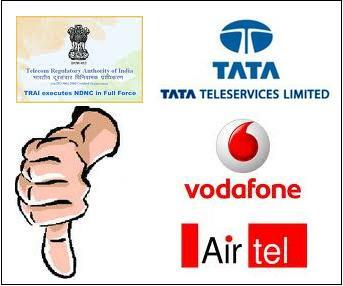 India’s GSM and CDMA operators including Tata Teleservices (TTSL), Bharti Airtel and Vodafone Essar strongly opposed and slammed Telecom Regulatory Authority of India (TRAI)’s recommendation to charge incumbents telecom operators a one time fee for holding 2G spectrum beyond 6.2 Mhz. TRAI has proposed introducing a uniform rate of 6% as annual licence fee component of total adjusted gross revenues from 2014.Presently operators pay in the range of 6 % to 10% as licence fees. Tata Teleservices Ltd (TTSL) said TRAI’s recommendations are shocking and it has completely ignored our status as a dual-technology holder, and that TTSL should have been given precedence over those who have already received minimum start-up spectrum of 4.4 MHz and now have been recommended to get 6.2 MHz. It is important for TTSL to get level playing field vis-a-vis other dual-technology holders who got spectrum, especially as TTSL has already been waiting for more than 30 months for the minimum start-up spectrum across various Circles, including Delhi . We hope this will be rectified by the authorities soon and that our long wait for minimum start-up spectrum will not be pushed further behind.